It's a lot of pressure to be a parent these days. Pinterest and Instagram have set new expectations of capturing perfect baby photos for your perfect, new bundle of joy. But many people don't realize that attempting these photos on your own or with an unexperienced photographer is extremely dangerous. Below you will see the most dangerous (and most pinned) infant poses and what a professional photographer should be doing to make sure your baby is completely safe. Your sweet infant doesn't have the strength to hold his or her head up. Do you really want to risk this balancing act? These photos can only be done safely by using parents to support the baby. Similar to the head on hands, a finger or hand should always support your little one. Babies' bodies are top heavy. Those wee little arms can't be expected to hold up their large head. Even if a prop is sitting safely on the ground, anytime your baby is perched in or on a prop, they must be supported. To do this safely, a photo of the hanging carrier is taken. Then a photo of the baby in the carrier on the ground being secured by the parent is taken. Never allow your baby to be suspended in the air. Inclines and babies don't mix. Don't set your baby on an incline. These sweet shots should be taken with the baby laying on a flat surface. That photo is then angled in post production. There's no need to dangerously place your baby on a surface they could slide off of. These photos look like the babies are being suspended in air in the arms of their parents, but attempting this is extremely dangerous. Instead, only allow photos like this to be taken sitting down with the infant laying on the parent's lap. Your newborn obviously cannot sit upright on their own, so this pose also must be done with the parent holding the baby upright. Remember to never force your baby into a position. Their fragile bodies should never be posed in a way their muscles won't naturally allow. 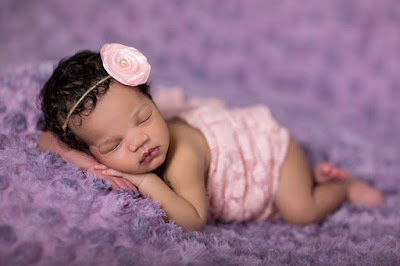 While you want beautitful photos of your sweet baby, their safety should be your first concern. Talk with your photographer about keeping your precious little babe safe during their photoshoot.